There are so many types of guitars out there that it can be a bit overwhelming to choose which one is the best option for you. One option to consider is the PRS Guitars. 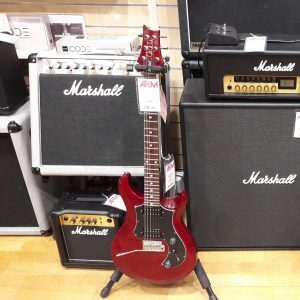 You can find PRS Guitars in Nottingham by coming to our location. You may not be as familiar with this brand as you may be with a Fender, but you never know before you try it out. Here is a closer look at PRS Guitars and why it can be an excellent option for your needs. Paul Reed Smith Guitars (also known simply as PRS) was founded in the mid-1980s in the United States. As a guitar player, Paul Reed Smith knew what musicians needed in their guitar and began to hand-build guitars for other people including those in popular bands. One very well-known person that helped this brand take off was the talented Carlos Santana. Later, this brand became synonymous with high-end and handcrafted guitars that did not have a competitive niche at the time. Typically, PRS guitars are created out of mahogany along with a maple top. They were stylized and had a unique look to them, which is something that helped to make PRS guitars a popular choice. What makes PRS guitars so great? For one thing, this is a company that not only invents intelligently designed guitars but they are constantly reinventing them in every aspect. They take a look at the bridges, neck, and body to ensure that they are optimized for comfortable play and that they only use the highest quality materials when making their guitars. Proprietary designs make PRS stand out from many other guitar brands that are out there. You can also rest easy knowing that this guitar company has strict quality standards for every guitar that comes out of their manufacturing lines. As soon as a guitar is completed, it is carefully inspected. Every single detail is looked and nothing goes up for sale that does not meet these very stringent standards for this company. It is the goal of this company to have their products sound as great as they look when you first pick up the guitar. These guitars are designed for style, comfort, excellent tone, and playability. These can be more affordable than a lot of other options out there. Since these are such high-quality guitars, beginners may favor them because they will not need to be upgraded as they get better with their skills. If you are looking to buy your first guitar or get a new one, it is important to go to the store and try them out for yourself. Not every guitar is made for every person, so it helps to get a feel for the guitar before you purchase one. By picking up and playing it in the store, you can see if it is a comfortable option that works for your individual needs. You do not want to spend all that money on a guitar that ultimately does not work for your music or play style. Not looking for PRS Guitars? We also have other Guitar Brands.